This chapter describes how to identify clusters in the data using unsupervised cluster analysis methods. 18.2.2. How to cluster already clustered data set? Is there structure in my data? What are typical clusters/groups are in this data set? There are two typical uses of cluster analysis. The first one aims at interpretation of clustering result. 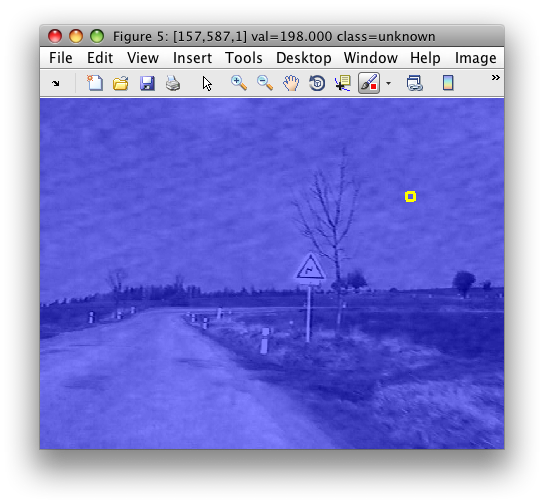 For example, we cluster an image (set of pixels in RGB feature space) and obtain a set of 10 clusters that represent different image regions. We then interpret (give meaning) to some of these clusters. In this way, we identify that some clusters represent sky, buildings or trees. 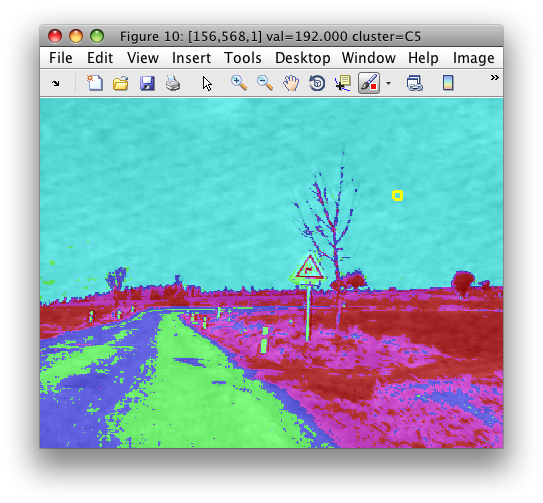 With these new labels, we may train a specific classifiers applicable to new images. Secondly, cluster analysis is often adopted as a tool for building a flexible data representation in complex supervised problems. The resulting set of clusters is used, for example, as prototypes for building better classifiers in multi-modal problems. With perClass, you may quickly cluster even very large data sets, easily interpret the results, and directly leverage this information for building your classifiers. Say we want to detect road in images. However, all we have are images without road labels. 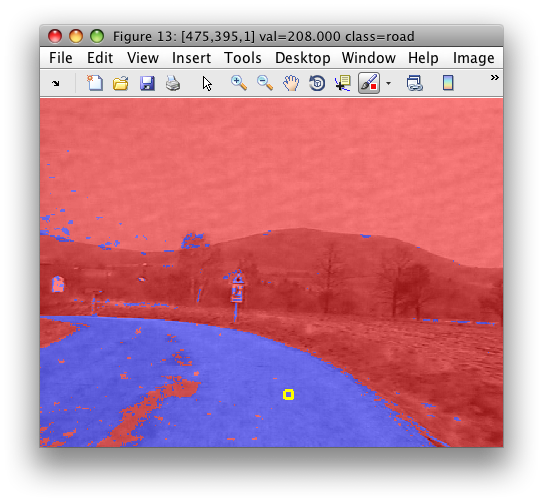 Instead of painting the road region by hand, we will use clustering to define class labels. The image shows a scene captured from a car. Note that we started from an image without any label information. Therefore, the image data set contains only the 'unknown' class. The . * operator is a shorthand for execution of pipeline pd returning decisions and setting these decisions back in the data set. In this example, we used cluster analysis to define meaningful class labels used for training a supervised classifier. sdcluster is a high-level command that allows us to perform cluster analysis on a data set with different clustering algorithms. It accepts a data set, untrained pipeline of the clustering algorithm and number of clusters. Optionally, we may provide extra options. In 3.0.0 release, sdcluster supports only sdkmeans and sdkcentres clustering algorithms. property for storing clustering result using sdcluster 'lab' option. Note that 'C1' and 'C2' names in the rows refer to different clusters than the 'C1' and 'C2' in the columns. Next section shows how to avoid such confusion. We may now easily distinguish the clusters in 'cluster' and in 'newcluster' properties. The set dd may be now clustered with sdcluster default setting which will add 'cluster' property. This section describes low-level clustering routines available in perClass. These routines may be used directly, without sdcluster. They provide a trained model (pipeline) which still needs to be applied to data to get clustering decisions. The k-means clustering algorithm minimizes within-cluster variability. It requires the parameter k denoting the number of desired clusters. Starting from a set of k randomly selected examples as cluster prototypes, it iteratively defines partitioning of the data set and shifts these prototypes to means of the new partitions. Note, that some of the initial k prototypes may disappear in the optimization process. Therefore, the resulting number of clusters may be lower. perClass provides high-speed sdkmeans implementation which is scalable to very large data sets. By default, sdkmeans works as a classifier. If we train it on a data set, it describes each class by a set of k prototypes and return 1-NN classifier. Note that it provides three outputs, each for one of the classes in a. The only difference of the later approach is that sdcluster included new 'cluster' labels while the data set b got the decisions set into the current label set referenced via b.lab. Because k-means algorithm derives (extracts) new prototypes by averaging original observations, prototypes do not contain any oroginal properties set in the clustered data set. Use k-centers algorithm if you wish to preserve prototype sample properties. k-centres algorithm selects k prototypes from the original data set by in such a way that the maximum distance within each cluster is minimized. The main difference with respect to the k-means algorithm is that k-centres prototypes are observations existing in the original data, while k-means exctracted new "virtual" prototypes by averaging. Use k-centres if you wish to find typical observations and use further their original properties. 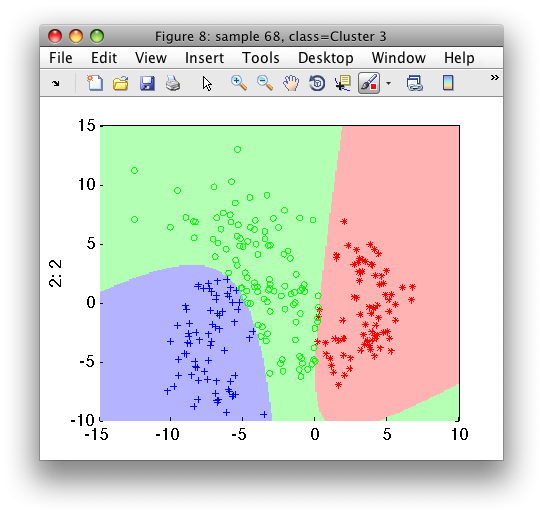 Gaussian mixture model available through sdmixture function may be used for data clustering. It has one substantial advantage with respect to k-means and k-centres algorithms: sdmixture may automatically select the number of clusters in the data. We received three outputs for the three classes in a.